This park contains a small group of medium-sized lakes containing wild trout stocks. This is unusual in the interior. 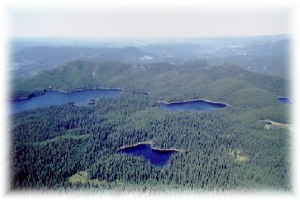 The park also represents an ecosystem of Engelmann Spruce-Sub-alpine Fir forest on the Nehalliston plateau. This is a wilderness area with opportunities for hiking and hunting. Some primitive user-maintained camping areas have been established. This is a wilderness area with infrequent Ranger patrols. Visitors must be self-sufficient and have advised a responsible adult of their intended destination and anticipated time of return. 16 km west of Little Fort, and 2.5 km north of Caverhill Lake on the Nehalliston Plateau. Access is by foot or horseback. History: Established April 30, 1996 as a result of recommendations made in the Kamloops Land and Resource Management Plan. Cultural Heritage: Located on a historic native travel route from Lac des Roches to North Thompson valley. Conservation: This park provides protection for a small group of medium-sized lakes, containing wild trout stocks. The park contains a small representative ecosystem of Englemann spruce/sub-alpine fir on the Nehalliston Plateau. Wildlife: Wild trout stocks are present in the park. Approved High Lakes Basin Provincial Park Management Direction Statement [PDF] is available online in pdf format. Canoe/kayak must be carried as no cart-accessible access trails exist. The lakes contain wild rainbow trout stocks. Anyone fishing or angling in British Columbia must have an appropriate licence. There are some primitive, unmarked trails into the park from nearby forestry roads. Contact local fishing resorts or angling guides for advice. Customary access is by foot or horseback. Please remain on existing trails. The park is open to hunting. All hunters should refer to the current BC Hunting and Trapping Regulation synopsis. There is no viewing platform but there are wildlife viewing opportunities. Some primitive user-maintained camping areas have been established.